Like most kids, my children love dessert. And, me? Some days, I want to cut sugar completely out of our lives because sugar is the devil. And, other days, I bake large batches of cookies after my kids go to bed because sugar is EVERYTHING and I want it all to myself. How much sugar am I comfortable with my kids having everyday? When do I say yes or no when they ask for treats? Can they smell the cookies when I’m baking them after they go to bed? And, this simple tip was my answer. In fact, my kids have almost completely stopped my kids from begging for desserts and sweets all the time. I first heard about this tip from a friend at a parenting meeting. It’s worked WONDERS. Before I get to what I’ve added to my calendar so my kids stop begging for dessert and sweets, I have to tell you that we’ve heard about other tips too. Maybe you’ve read this too? You can’t control or dictate the quantity of food your child eats, and you shouldn’t try. You also can’t control or dictate the kind of body your child develops, and you shouldn’t try. What you can do, and it is a great deal, is set things up for your child so she, herself, can regulate her food intake as well as possible, and so she can develop a healthy body that is constitutionally right for her. If you put dessert on the plate alongside the stuff kids should be eating instead of giving it to them after dinner as a reward, it takes away the “power” of dessert. Honestly, you can use our idea along with Satter’s argument and you’ll likely have an even more powerful strategy for dealing with kids begging for dessert. I knew this was something that we could try that would make me and my kids happy. Her eyes rolled as if to say, isn’t this an obvious solution? No, I remember thinking, this is not an obvious solution – TELL ME MORE! She dived into a quick explanation and the reasoning behind why she does treat nights and I was hooked. In fact, these two little words – “treat night” – have saved my sanity. And, it can save yours too. Here are the details about what “treat night” is, how it works in our family, and – more importantly – how it will work for your family. So, what is treat night? Said simply, “treat night” is a specific night during the week when you have dessert or treats. The catch? You DON’T have desserts or sweets on non-treat nights. In other words, this won’t work if you have dessert every night. Instead, schedule treat night once, twice, or three times a week. Whatever works for your family (we have 2 specified days per week on Mondays and Thursdays with “free days” on the weekend – I’ll talk more about that later). Kids get to decide how much dessert or sweets that they have on treat night (Yes, that can be hard. But, it’s an important part!). But, I’m telling you, this has worked great for our family for a few reasons. 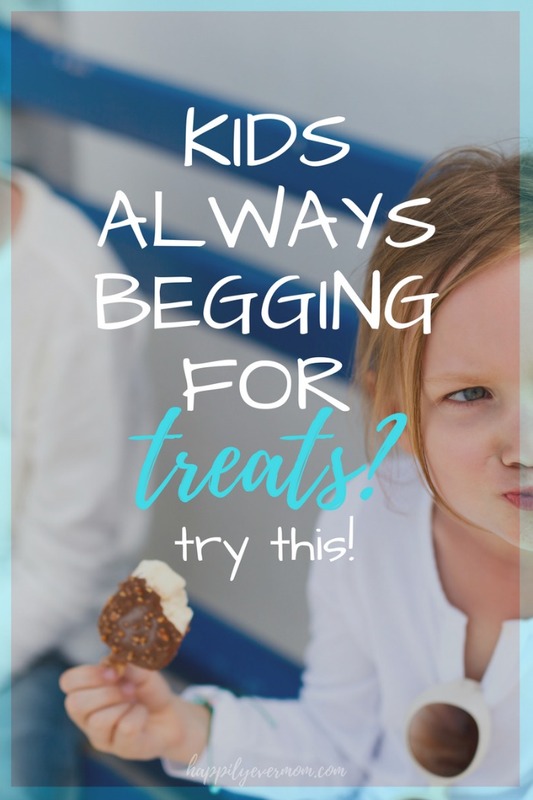 My kids know the schedule – they know when treat night is coming, so they ask less about whether or not they can have sweets randomly during the week. My kids beg less because my kids determine how much of the treats or dessert they eat – without me butting in to set a limit. Of course, like any system, there are exceptions. When we travel or when we are visiting someone’s home, I remind my kids that the rules are different. For example, when we’re at Grandparent’s houses, I try to go with the flow and say something like “What happens at Grandmas’, stays at Grandmas’. '” That’s my code for: we have way too many sweets and desserts while we’re there, but hey? That’s what Grandparents are for. We also don’t follow treat nights very strictly on the weekend – I call them “free days.” Because weekends can be more unpredictable (with birthdays, visitors, or drive by ice cream trucks), we’ve learned to be more flexible then. You might have to be stricter about this with your family, but this works for our family without my kids begging all weekend long. What Does Treat Night Teach Your Kids? My hope is that my kids will learn that eating sweets isn’t “bad” but rather that it’s important to eat sweets in moderation. I don’t want to have to always be the bad guy who says, “No treats!” and I won’t always be there to moderate their food for them. Instead, I’m trying to build moderation into our weekly routine so that my kids expect to only eat desserts and sweets a few times a week instead of every day. That’s what treat night is all about – teaching my kids to eat sweets in moderation without having to say “no” all the time. Because I really do sympathize with my kids. I wish we could eat sweets all day long too. But, I also want my kids to live long, healthy lives. In order to do that, they need to learn how to balance what they want to eat with what they need to eat. And, I think treat nights help to teach them that balance. I don’t know if treat nights will always be the right answer for my family or for yours. But, I do know that for now, treat nights are working great. They’re learning that not every night is about having desserts or sweets. Then, I’ll owe them a serious explanation.